Our final (very nice) surprise was delivered in the Alta Audio room. Alta’s own modest yet attractive two-way floor-standers (the Rhea, $4495) were paired with the Nuprime DAC-10 pre-amp ($1500) and REF20 mono-blocks ($7600). If the electronics and speakers were definitely approachable, the source wasn’t: the Grand Prix Monaco v1.5, Triplanar Ultimate 12” tonearm, Lyra Scala cartridge and the latest Tom Evans Groove+ phono-stage. Roll that lot together and it adds up to around three times the rest of the chain, but you couldn’t argue with the musical results. Relaxed but clearly structured, with the explicit tempi and explosive dynamics that characterize the GPA ‘table, this system was both extremely engaging and expressive. 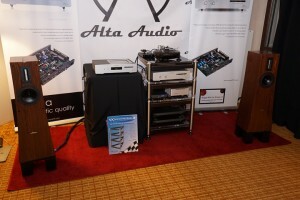 Rhythmically secure and musically articulate, capable of great delicacy and fluid phrasing, this set up made the Alta Audio room a welcome oasis of musical calm amidst the hustle and bustle of the show.